The HO team is now working on Jamestown module section. The scenery team is has completed three bridges and are working on Bombo Beach harbour town scene. Jamestown has been removed completely. New track and board laid. 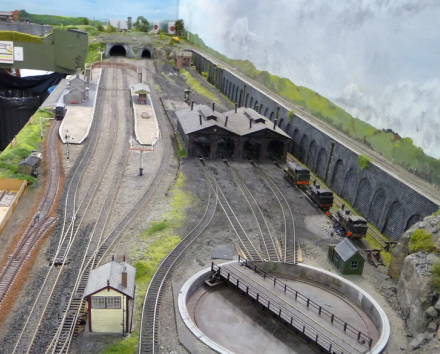 It will be replaced with cement works plant and sidings, a small country town and a ballast quarry. Anyway these are the plans as of October 2016. The final design will change slightly as construction progresses. In the next module Calendonia has been stripped, up to the underground roadway. This will be replaced with a British branch line end of line station and goods yard servicing a dairy. 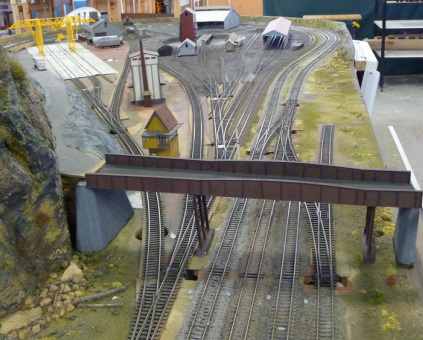 The HO/OO layout has 90 metres of dual track mainline and numerous branch lines on a footprint of 10 metres by 11 metres. 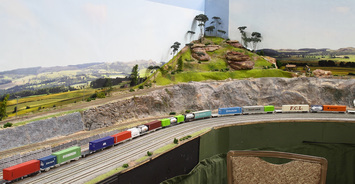 Some of our younger members are developing one area to enable it to handle the long trains typical of modern prototypical trains. We are currently developing wiring and trackwork to allow three separate lines to be operated. We are also looking at redeveloping more areas to enhance operations. The Albion story. If you wish to read the invented history of this area of the layout click on this link /flexible-wheelbases.html This history was developed to justify any modeling done in this area, to keep it consistent within the theme. A NSWGR Daily mail passes a farm with a pig (C36) in charge.